In the A.M. edition of Monday's Hot Clicks, Klay Thompson gets rejected at a club, the world's ugliest dog is crowned, and actress Lindsey Morgan is the Lovely Lady of the Day. NBA Stars. They're Just Like Us! There's nothing worse than waiting in line to get inside a club, especially when you see people deemed more important zoom right in without having to wait with the commoners. 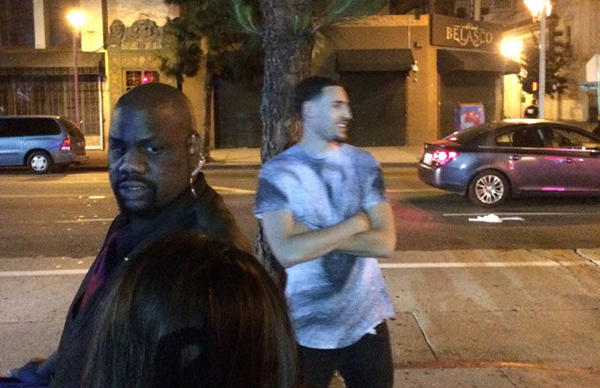 Klay Thompson thought a NBA title would place him in the "doesn't have to wait in line" category when he visited a L.A. club over the weekend. It didn't quite work out like that. Don't feel too bad for Klay though—he can always call his twerking pal to keep him company. Meet Quasi Modo, a 10-year-old pit bull-Dutch shepherd mix with a minor hunchback. Congrats to Alan “Nasty” Nash, who captures his 12th Toe Wrestling Championship in Derbyshire, England, over the weekend. Toe wrestling, as you know, involves two competitors sitting on the floor with their toes locked together on a small platform. Harrison from Kirkland, Wa., wrote in and requested some love for American actress Lindsey Morgan. Good request, Harrison from Kirkland. Lindsey is today's LLOD (click here for full-size gallery). 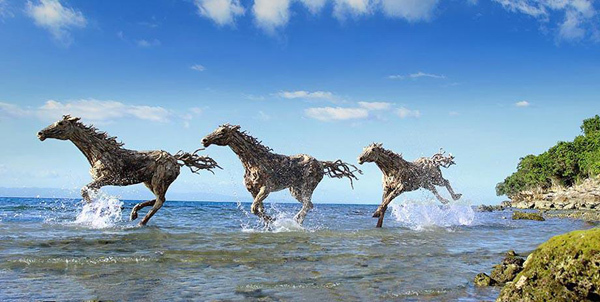 James Doran Webb is my new favorite driftwood artist. Former Braves pitcher John Rocker was invited to be the guest of honor at a recent Carolina Mudcats game, where he would throw out the first pitch and greet fans prior to the game. Then he tweeted about Caitlyn Jenner. They'll make anything out of a MLB logo these days and it'll look cool. Aaron Rodgers and Olivia Munn are not only still together, but also sword fighting ... NHL Draft photo diary ... Kevin Durant takes his Pop-A-Shot very seriously ... Alabama commit Eddy Pineiro drilled a 73-yard field goal ... This sequence made me love Bubba Watson ... How the Fish Kick became the fastest stroke in swimming ... The weekend's biggest referee blunder took place in boxing ... Seven strange pieces of Blackhawks paraphernalia ... Bengals receiver Mohamed Sanu has some hoops skills ... Rihanna got Floyd Mayweather to shut up ... 12 great GIFs of UFC ring girls in action ... Big news: A musical production of The OC is in the works ... As a proud native of Framingham, it's good to see "masshole" get added to the Oxford Dictionary ... Rough moment for CNN ... Diddy fell into a hole during the BET Awards. Patrick Kane brings the Stanley Cup onstage for Volcano during a Jimmy Buffet show in Chicago. Vincent and Bianca Wilfork perform Method Man's You're All I Need. Since today would've been Harmon Killebrew's 79th birthday and MLB just announced changes for this year's Home Run Derby, I thought it'd be appropriate to look at the event way back in the day. Uproxx compiled the best It's Always Sunny inventions, including Charlie Kelly's Kitten Mittens.